I haven’t found where Donna was before the showing at the Avenue Theater on Christmas Day, 1919. 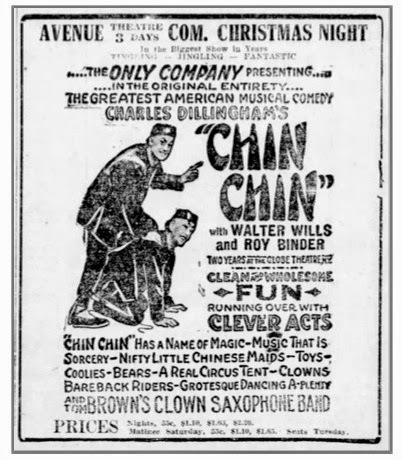 The “Chin Chin” company was in Pendleton, Oregon, on December 10th. I am sure that the company continued west, probably played in and around Portland, then headed north. They probably played in Seattle area before continuing on to Vancouver, British Columbia. Advertising appears to have begun with a short article on the 13th of December letting people know that the show was commencing on Christmas Day – No holiday rest for the “Chin Chin” cast. The article points to the show’s success at the Globe Theatre in New York for two years and by the box office receipts during its road tour. There is also reference to the composer, Ivan Caryll, the writers, and the leading roles played by Walter Wills and Roy Binder. On December 20th, there was a long article explaining the show and many of its highlights. Also on the 20th was the first of many standard “Chin Chin” ads. Articles and ads continue on the 23rd. Neither the Julius Cahn Gus Hill Theatrical Guide (1913-1914) nor the 1922 Supplement include any Vancouver, BC, theatres. I did find another guide from the 1930s that mentioned the Avenue Theatre, but it indicated that the theatre hadn’t supplied any information regarding itself. Herbert Lloyd’s “Vaudeville Trails Thru the West” (1919) does include Vancouver, BC, theatres. The Columbia, Orpheum, and Pantages’ Theatres are covered in detail, but nothing about the Avenue. 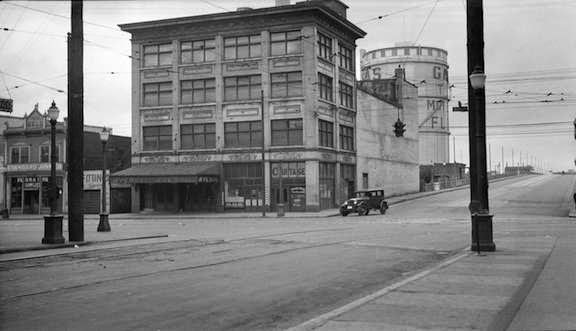 The theatre fell into disuse about 1930 and was demolished about 1936, It was only a 25 year-old building. Vancouver As It Was: A Photo-Historical Journey – ELECTRIC VAUDEVILLE – https://vanasitwas.wordpress.com/2014/08/09/electric-vaudeville/. Next Next post: Letter of Delores Sarah Brown Pribbenow dated Letter – 4 April 2005.